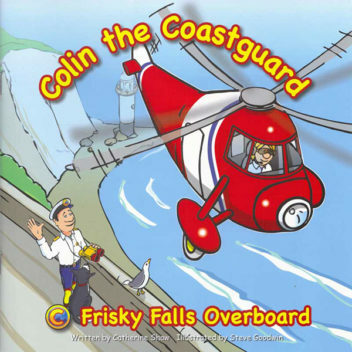 Colin The Coastguard Frisky Falls Overboard. School boy Matt smuggles his pet puppy on to the Pebble Island Ferry. Trouble ahead! An emergency…Colin to the rescue with the help of Chesil and her red helicopter.red faces;lessons learned:dramatic rescues;more new friends for Colin and Rocky. Bold colourful illustrations, clear simple text and a quiz. Suitable for ages 4 – 7 years.